Mumbai, April 25, 2017: Bollywood actress Diana Penty engaged with culture enthusiasts Taaniko and Vienna Nordstrom, from New Zealand Company - Soldiers Rd Portraits - at an event in Mumbai today. The Nordstrom duo introduced the audience to New Zealand’s Maori culture through interesting activities, while Diana expressed her curiosity for the diverse culture and its importance and significance. With Indian travellers showing an increased interest in culturally immersive getaways, Tourism New Zealand in India curated the event to raise awareness about the destination, and showcase the country’s other offerings that go beyond beautiful landscapes and adventure experiences. 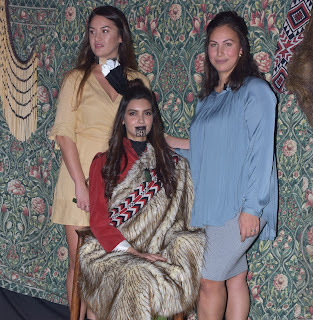 Taaniko and Vienna Nordstrom, through a presentation and engaging activities highlighted New Zealand’s Maori culture and customs, in particular food, fashion, history, art and music. The duo, with their skills, meticulously transformed Diana Penty in the style of a Maori ancestor, wearing a blend of traditional Maori and European clothing, and a temporary facial tattoo, also known as kirituhi. The experience is designed to emulate a portrait of a Maori ancestor and inspire and educate guests about Maori culture. Tourism New Zealand Regional Manager for South and South-East Asia, Steven Dixon said the event was also a great opportunity to highlight the similarities between our two countries.